If Don Buchla, mastermind of early modular synthesizers, was the technician behind the lysergically tinted spiritualism of countless ‘60s timbric explorations, Peter Blasser is an audio alchemist: technician, musician, and guru rolled into one. Blasser’s electronics company based in Baltimore, Ciat-Lonbarde, produces small runs on some of the most ingeniously quirky electro-acoustic audio systems on the market. Take one of Ciat-Lonbarde’s most popular boxes, the Sidrassi organ, which Blasser himself plays in the above video. 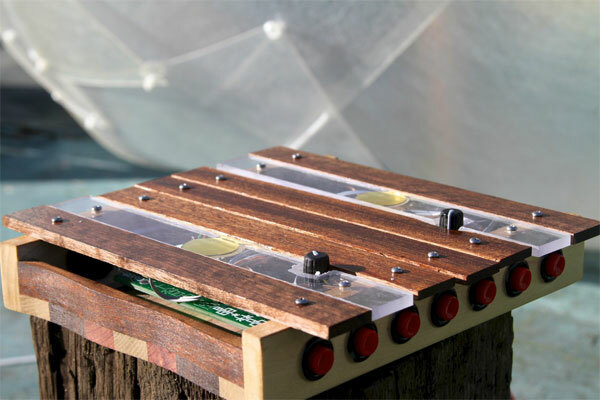 Two oscillators modulate the tones of seven wooden bars, each of which are attached to piezo microphones and can be set to random tones by a button corresponding to each bar. Moreover, there is a matrix of 47 nodes that can be freely wired together in any order to further bend the sound, a process which Blasser calls programming an analog brain. Musically, the Sidrassi organ occupies its own solar system. The destroyed and bent tonal qualities of the instrument separate it from classical modular systems, but the distinctively analog sound of the box separates it from any laptop based excursions. Blasser’s myriad inventions are so unique that he has formed the basis for the careers of many musicians in addition to his own band, Sejayno. Seminal noise bands like Nautical Almanac, Metalux and Brown Wing Overdrive all have heavily used Blasser’s electronics in their improvisations. Music aside, the Sidrassi organ is a beautiful box; Ciat-Lonbarde instruments are as creative visually as aurally. Blasser has made instruments out of wood salvaged from a lightning struck tree. He has built complex circuits into paper resembling a tea cozy. He has attached fish to aluminum pans to create a working antenna. Indeed, Blasser’s strong extra-musical ideas greatly expand the implications of his instruments. What’s rare about Blasser is that among his synth building peers, nobody else has an attitude as absurd or an imagination as explosive. Perhaps the strongest example of the extra-musical implications of Blasser’s instruments is his Theremin work. 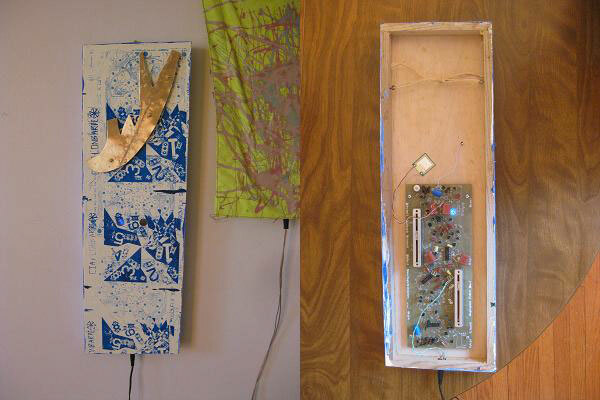 The Deerhorn theremin is presented as an expressively painted tapestry onto which a circuit built on paper has been sewn, with a series of aluminum antennae hanging at odd angles. When a person approaches the instrument, he modifies the electromagnetic field around the theremin and generates a sound. The speed and direction of movement can create huge variety in the expressive sounds of the instrument. Unlike most theremins, cross-modulation is enabled between the antennae to create interference patterns that hardly resemble a classical theremin’s timbre. It’s a wonderfully participatory gallery piece that invites all viewers to interact in their own way with the bizarre artifact. With his Deerhorn theremin, Blasser addresses the question, “what is the museum of the invisible like?” To Blasser, the theremin creates a strong analogy for the spiritual in music. The pitch and volume of a theremin is modified without touching the instrument. One plays it by moving his hands around the antennae to manipulate the invisible electromagnetic forces surrounding the instrument. Because of the invisibly working mechanics behind the theremin, the theremin “is a tribute to our souls, which have no body.” Religious musings like this are typical for Blasser. Though his reasoning is usually disjointed, it’s compelling. After all, isn’t Newton’s Law that every force has an equal and opposite reaction much the same as the Jodorowskian “To give and to receive are the same”? This last quote actually ends a piece Blasser wrote for Leonardo Music Journal, in which he discusses his circuit boards made of paper. Blasser points out that paper is the cheapest, most convenient and most ecologically sound material for building circuit boards. While paper circuit boards aren’t very practical for mass production, paper is ideal for teaching circuitry; the schematic for a circuit board doubles as the house for the circuit. One need nearly poke wire through the paper on the dots and solder. In typical form, Blasser compares the practice of building his geometrically arranged circuits on paper to mandala building. 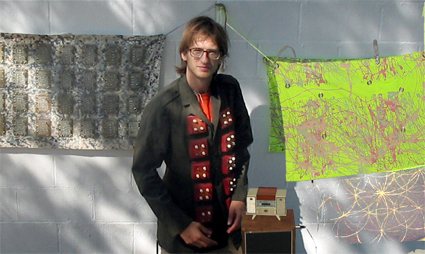 What’s remarkable here is that Blasser has reduced the construction of a modular synthesizer to a hobby as simple and therapeutic as knitting a scarf. Nat Roe is a DJ with WFMU and the editor of WFMU's blog. He is also an administrator at the Free Music Archive. He has contributed in the past to The Wire, Signal To Noise and Rhizome. Nat also cooperatively manages Silent Barn, a DIY venue in Ridgewood, Queens.